Introductory Guitar Classes in Sun Prairie, WI Begin January 31! Start learning guitar in the new year and you can be playing songs around the campfire this summer! You will also be able enjoy playing guitar in a group right away. Learn the basics of playing guitar from the ground up; how to hold the guitar, tune, play single notes and chords, and accompany songs using strumming and fingerpicking. Fundamentals of music such as rhythm and song structure will be covered as well as exercises to develop finger strength and dexterity. Lots of “hands-on” experience playing together as a group in a variety of styles tailored to the interests of the group including pop, rock, folk, blues, country and even a touch of Spanish Flamenco. Students must bring their own guitar. Instructional materials will be provided. ​Further Instructional materials will be provided. * If you could use some guidance on what kind of guitar to get and/or where to purchase the Hal Leonard Method book please let me know. I am happy to help! Individual lessons for guitar, songwriting, ukulele, and vocal coaching for guitarists also available. When I moved to the Madison WI area from New York I left behind a very full schedule of teaching up to 11 college classes (some credit, some credit free) and 35 individual students a week plus performing and writing music. For the past several years I have been teaching part time with a couple days a week at Guitar Center Middleton and a small number of on-line and home studio students plus summer sessions at Girls Rock Camp Madison. This January 2019 I will be expanding back into teaching Introductory Guitar Classes. I taught these classes for 15 years to students from ages 7 - 85. I found it very rewarding as the students tended to progress well as a group and a really fun group personality would emerge each time. It seemed that having peers to watch as well as the teacher helped inspire everyone, and we were able to make some very nice music that would not have been as big and full otherwise. Some of the students went on to more advanced classes and/or private study with me. I am fortunate to stay in touch with a number of them. Many are still playing, some are performing regularly, some are also hosting their own performance nights at local venues and some have gone on to be music educators as well. I look forward to seeing who comes to these Introductory classes and what kind of music we will make together! 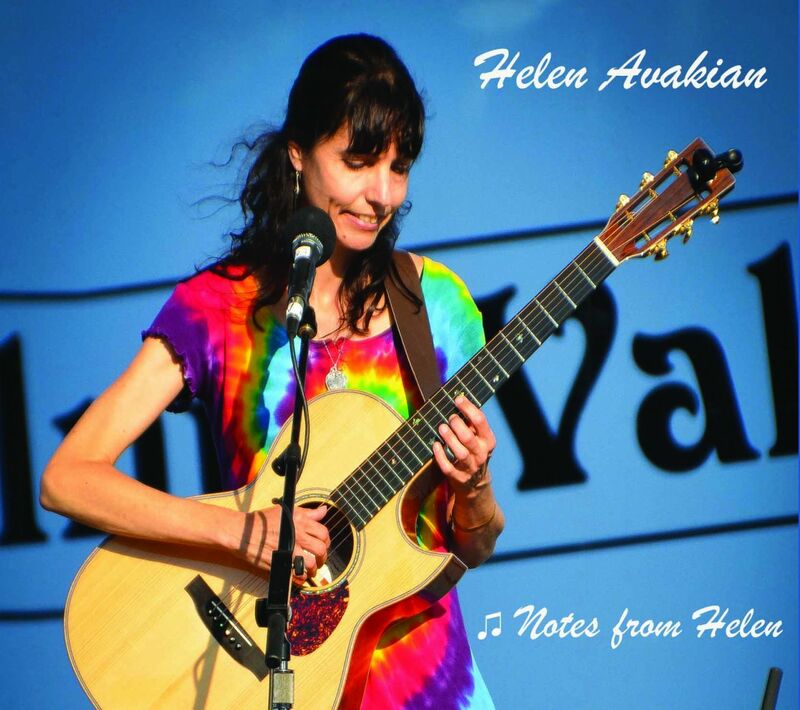 Just out in the September issue of Acoustic Guitar Magazine: "Helen Avakian's first all-instrumental CD is an impressive introduction to the winner of the 2014 International Fingerstyle Guitar Championship... (Avakian) deftly serves up a wonderfully eclectic program that showcases the breadth of her talent as a solo guitarist working in a wide variety of styles... Guitarists will find much to marvel at: The arrangements are consistently imaginative..." Plus there are favorable to comparisons made to musicians I have long admired, such as Will Ackerman, Alex de Grassi, Micheal Hedges and even the Grateful Dead! I am so thrilled to appear in a magazine I have been enjoying since the early 1990's and before! An ad for the Walnut Valley Festival appears on the same page, a very cool and perfect juxtaposition! I first heard of the WV Fest from Acoustic Guitar, again back in the '90's when I read about National Fingerstyle Guitar Champion, the amazing Muriel Anderson. In addition, "Notes from Helen" would not have been made when it was if I had not won the International Guitar Fingerstyle Championship myself last September. The prize money and boost in confidence inspired me to record the CD. "Notes from Helen" has just received a positive review from Chris Spector of Midwest Record. In the review Chris talks about one of my big guitar heroes, Muriel Anderson as well. Muriel and I have an upcoming concert together at The Towne Crier Cafe . Hudson Valley residents you are cordially invited! I am off the charts delighted and grateful!!! I am excited and grateful to say I am featured in the prestigious and educational Fingerstyle 360! There is also a transcription of my Celtic influenced guitar instrumental, McTammy's Jig, along with stories and music of artists such as Adam Levy (guitarist and songwriter with Nora Jones), Stephanie Jackson (classical and harp guitarist who I had the pleasure of appearing with in the Woodchoppers Ball) and many others. The cover story is on the amazing Tommy Emmanuel, one of my major guitar idols! If you read the magazine (which I hope you will do) you will see my Taylor 714CE guitar with Tommy Emmanuel's autograph! My latest CD, "Notes from Helen," is out! It is a collection of solo guitar original instrumentals plus arrangements of some of my favorite songs by artists Ralph Towner, George Gershwin, Stevie Wonder and The Beatles. I am most fortunate have an appearance by Guitar Star, Pete Huttlinger, in a duet performance of his lovely "Monaghan Jig." You can order the album on the CD page!